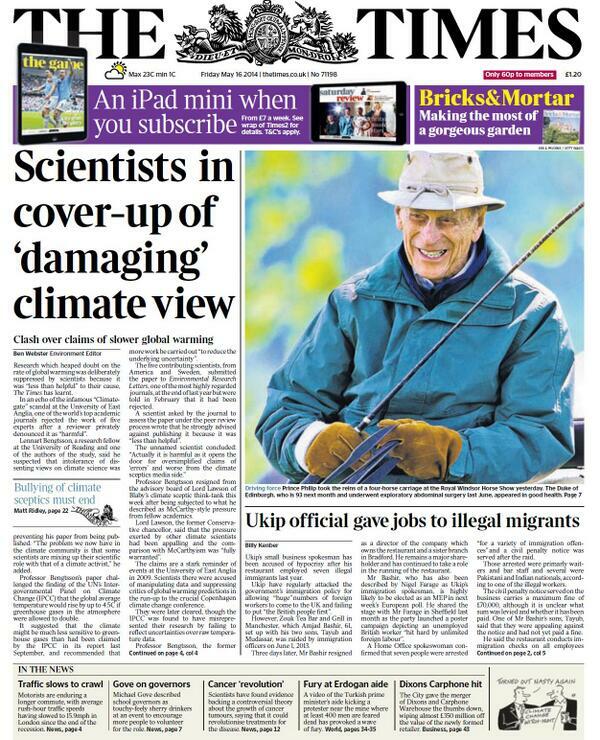 Today many people are surprised that The Times turned non-news into news by putting it on their frontpage: the fact that a paper by Lennart Bengtsson was rejected by Environmental Research Letters. Rejections of papers happens hundreds of times a day, so why put it on the frontpage? Well, the answer is simple, because it fits into a larger “story”. The larger story of course is that Bengtsson accused the climate science community of McCarthyism. Lennart Bengtsson, a research fellow at the University of Reading and one of the authors of the study, said he suspected that intolerance of dissenting views on climate science was preventing his paper from being published. “The problem we now have in the climate community is that some scientists are mixing up their scientific role with that of a climate activist,” he added. Non-news becoming news happens all the time in the media, this is how they work. When they smell there is an “affair”, tiny things suddenly get promoted to the frontpage. This happened after climategate as well. Suddenly it was news that AR4 wrongly claimed that Himalayan glaciers would be gone in 2035. I am convinced that without climategate all these other IPCC “gates” wouldn’t have been picked up by the media. “With current debate around the dangers of providing a false sense of ‘balance’ on a topic as societally important as climate change, we’re quite astonished that The Times has taken the decision to put such a non-story on its front page. I wish publishers and/or scientists were always so keen to correct decisions of the media, e.g. in case scientific claims are exaggerated. The manuscript uses a simple energy budget equation (as employed e.g. by Gregory et al 2004, 2008, Otto et al 2013) to test the consistency between three recent “assessments” of radiative forcing and climate sensitivity (not really equilibrium climate sensitivity in the case of observational studies). The study finds significant differences between the three assessments and also finds that the independent assessments of forcing and climate sensitivity within AR5 are not consistent if one assumes the simple energy balance model to be a perfect description of reality. In our report we also describe the energy budget method. We actually favor it and claim it currently gives the best indication of the climate sensitivity of the current climate. Nic Lewis now defends this position in the Climate Dialogue that the Dutch institutes PBL, KNMI and myself have set up about this topic. The overall innovation of the manuscript is very low, as the calculations made to compare the three studies are already available within each of the sources, most directly in Otto et al. So one may conclude that we see here peer reviewed evidence that our report wasn’t fit for a peer reviewed journal as well. Summarising, the simplistic comparison of ranges from AR4, AR5, and Otto et al, combined with the statement they they are inconsistent is less then helpful, actually it is harmful as it opens the door for oversimplified claims of “errors” and worse from the climate sceptics media side. These kind of motivations should have no place in a reviewer’s report and if I were the reviewer I would have been unhappy to make my report public like IOP now did. Thus, the “error” (according to the publisher) seems to be nothing more than Bengtsson’s expectation that models be consistent with observations. Surely, even in climate science, this expectation cannot be seriously described as an “error”. Bengtsson is trying to walk this back now. Links everywhere. Pass the popcorn. When a blog post about nothing becomes another blog post about nothing.